Members vote for three 3-year candidates and one 1-year candidate. Please tell about yourself: explain why you are running and why you will be a great addition to the PMCPOA board of directors. What personal qualities, qualifications and experience will make you a good choice? As a 23-year resident of PMC. I have served on the Board of Directors for 3 years, the Budget, Communications, Planning, and Gov. Docs Committees. I was Chairman and Vice Chairman of the Board of Directors. I would like to assist the General Manager and Staff in improving and maintaining our assets, programs and services to our members while keeping our costs at a minimum. I owned and ran a successful California business. I will be the Board member that protects the member’s investment in this great community. I have the business management expertise in my career with General Tire. I have conducted myself accordingly with prior Board service. The current Board has no member with prior history in retail management which I offer. I have recorded the past eleven year’s annual audits which I reference to correct the misjudgments of the past Boards. Please vote for me. My family has lived in PMC for the last 5 ½ years. I have over 28 years of experience in the fire service, 17 years as a firefighter paramedic. I feel my training, knowledge and experience would be an invaluable asset to the board and the community. I have a can-do attitude which is critical when dealing with the general membership and feel that relationships are the keys to success in any organization. My undergraduate degree is in Accounting and my Masters is in Finance. I worked in operations to compiling complex financial statements. Currently for Kern County I am an integral part of a team responsible for budgeting $2 billion dollars. I help with financing and presented bonds to S&P and Moody’s. I love the community of Pine Mountain and want to use experience and education to help the POA manage a financially strong organization during this recession. The challenges I have dealt with as a law enforcement manager, labor negotiator, school board member and coach along with being a member of this fine community has provided me with some unique varied experience. This experience includes protecting assets through budgets, developing and enacting emergency preparedness plans, being open and approachable and looking both long and short term through input from peers and co-workers. It is this shared vision that can make a difference. I’ve been in management most of my working years overseeing 100 plus employees and millions of dollars. I’ve dealt with department budgets, Corporate accounting, Computer system accounting, directed system conversions, dealt with legal, government, and regulatory agencies, directed large money movements. My background and expertise should lend nicely to this community’s care and maintenance while using the past to bring about good judgements for the future. My candidacy for a 3 year term on the Board of Directors is based on my experience. That experience includes being a leader of associations that have both a large voluntary force and a small paid staff that have worked to accomplish the aims of the membership of the associations. Experience in managing a variety of real estate and maintaining that real estate at a level that the ownership of the real estate expects. My resume is now of public record. I learned through my involvement and leadership in two major industries that 95% of unsuccessful projects fail in their planning stages due to insufficient and/or faulty information and knowledge. I bring no preconceived personal or political agendas; only my strong advocacy for the nearly lost art of common sense. Only when I’ve ascertained that something is broken will I devote my full energy to getting it fixed. In your opinion what are the greatest strengths of Pine Mountain as a place to live, and of Pine Mountain Club POA as a managing organization? What needs to be improved? Does renewal of the CC&Rs relate to those strengths or not? How? PMC is well-cared-for due to our CC&R’s. Our young families/ member/owners are our greatest strength. PMCPOA is a combination of member/owners (the Board), knowledgeable staff hired to serve the community, and member/volunteers on Committees and Projects. We must remember our objectives and stop redoubling our efforts by consistently changing General Managers. Renewal of CC&R’s is crucial to our well-being. Without CC&Rs, we will have no funds to take care of our assets. Strength of PMC lies in its people. Residents chose here for the same core values. Beautiful locale with four seasons, clean air, neighborhood friendliness, a balanced lifestyle where you can work/relax at a comfortable pace. POA is taking the initiative by recognizing that CCRs needed review to assist in maintaining or improving our infrastructure, amenities, safety etc. Appropriately reached out and provided an opportunity for residents to enhance their community. 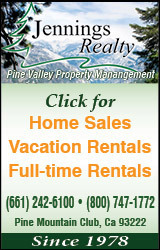 I purchased property in 1985 because PMC offered a quiet, peaceful, clean air, free of crime atmosphere. PMC is a self supporting community managed by your neighbors. Unfortunately, some board members have separate agendas. Our facilities are 38 years old but they have been maintained every year and I will continue this philosophy. I will continue to improve these assets and amenities. The CC&Rs must be renewed so PMC will remain a private community. PMC offers us mountain living at it’s best with clean air, beauty and the tranquility of living in a safe rural mountain setting away from large metropolitan areas. By living a community such as ours, improvements are an ongoing process. Fortunately, we have the ability to give the citizens correct and accurate information to make informed, educated choices regarding any future improvements in Pine Mountain Club. The greatest strength of PMC is the CC&Rs and the most important vehicle needed to keep the community moving forward in its continual improvement is the passage of the updated CC&Rs. Another major goal of mine is to work with the Environmental Control Committee on the enhancement of the Environmental Control Code so that the Code reflects the needs of the Community and is administered in a fair and evenly manner. Unlike other places such as Big Bear, Pine Mountain is totally surrounded by the National Forest. This limits our growth and allows us natural beauty. We are not along any busy freeways and is my place to escape from the rigors of the City on a daily basis. Mutual respect between members and the board needs to be improved. The changes in staff do not reflect a strong ongoing management style. The CC&R are important. PMC’s geography, the beauty and peace of its natural environment are undoubtedly overriding reasons to choose it as our home. These attributes might not endure in our lives if it were not for the CC&R’s; no CC&R’s, no PMC as we know it. Leadership MUST work in unity, with the sole intent to improve rather than make changes for change’s sake, a known temptation for those who would achieve visibility rather than true leadership. Most shopkeepers in Pine Mountain Village pay rent to property owners who own the buildings. More than two dozen commercial properties pay only a single property assessment ($1,283 among all of them, about $50 a year each). The total would be over $33,000 if the commercial property owners were not being subsidized by the homeowners. Do you think this should be changed? I do not support the court judgment permitting all commercial properties to pay a single assessment. It is unfair, and perhaps impossible to correct. Need to look at that more in-depth. It does appear to have an inquity for all when you consider the size of some properties. The Commercial Center has 28 properties that sued PMCPOA. The Judge rendered a Stipulated Judgment to pay one assessment which can not be changed unilaterally. Many years ago there was a Stipulated Judgement which won by the Business Property Owners. There is nothing further to be done. As a board member I would work with the PMC business owners association to see if there where any previous agreements or documents regarding this. The Village and all its activities are an intricate part of the Community and the Boards of both groups must work together to enhance PMC. I do not understand how those assessments are levied. I do believe each lot should have to pay a full assessment. “Most” and “more than” speak of arguable facts and figures. We must look for irrefutable evidence; if unfairness is established, it must be corrected. 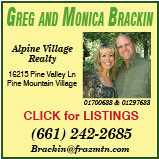 What are your ideas for making Pine Mountain as “family friendly” as it can be? What needs to change? Give examples. Do you think that is important? Why? Tearing down the walls in the Condor Room and allowing families to enjoy dinner/ entertainment is a good start. Activities, for all age groups, in all seasons, is a must. Artists/ musicians/business owner mentoring for the young adults on a volunteer-no fees-requested basis would be a wonderful program that I would like to promote and devote time toward. It is important because they are PMC’s future not to mention the future of our nation. The majority of PMC is young families. The Board should pursue adding activities that cater to families. We currently provide “Sport Camps” and “Concerts on the Greens.” The Board needs to reinstate the Teen Committee to advise the Board on any family orientated improvements. The Board must maintain a Recreation Director that organizes softball, soccer, crafts, and Teen nights for younger members. With the recent implementation of the Paramedic program, I foresee more families moving to PMC with the satisfaction of feeling safe. We have several resources that make this a family oriented community such as, swimming, hiking, golfing, and tennis just to name a few. As a board member with two small children, I would be open to any suggestions from the community for safe family recreational events. Important to consider ‘family friendly’ ideas and issues at PMC. The increase in families establishing residency cannot be minimized. I would like to see continued work in the area of the summer concerts, improving our adult/child sports programs at the park, events at the Gazebo, pool or clubhouse. Families and their friends are potential revenue sources that may assist with off-setting assessment increases if appropriately developed or enhanced. It is always important to provide space for children. I believe we have done a good job in this community. We have horse stables, golf, basketball courts, tennis courts, a baseball field, small children’s park play equipment, a recreation room just for them, and a swimming pool. The National Forest provides hiking and exploring in a clean environment. This is a safe community which is for the most part free of crime. PMC is family friendly in many ways, however, it could be even better with the formation of a Committee to work with the other Committees and the Board to enhance the youth activities and experiences. We need to the listen to needs of the parents and the youth. There are many good suggestions floating around that need to be reviewed and implemented if at all possible. Parent participation is critical in all youth activities. It is important. This is a community made up of families. Therefore what is important to families should be important to the community. I believe we should concentrate on having family events like the Lilac Festival. I also believe we need more for the youth to do. If they have nothing to do that is when they get in trouble with bad behavior. I perceive nothing unfriendly to families in our community, save perhaps the mentality of the few. Leadership that encourages a “family friendly” attitude is a must, but no amount of expenditure can achieve what community members can accomplish individually and collectively. Inclusion is a requirement, but it is the role of families, through involvement and volunteerism to generate meaningful participation and activities for their children. Apathy is detrimental to all; involvement MAKES a community. Transparency in the conduct of POA affairs is important to most members. The Davis-Stirling Act defines the responsibility of POA directors to deliberate and vote in meetings open to the membership, except on personnel, lawsuit and contract negotiation issues. But recent boards have made a habit of slipping into inappropriate Executive Session discussions. What will you do to stop this if you are elected to the board? 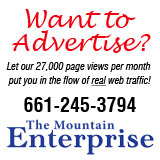 Will you support videotaping of meetings, and defend the newspaper’s right to report on issues of concern to Pine Mountain residents? The three categories are the only discussions appropriate for Executive Session. When I Chaired the Board, every Chair report contained a summary of what was discussed in Executive session (with the exception of the confidential matters). It has not been done since I left the Board. Every member should be told who is suing them, for how much, and why. Videotaping and honest reporting will be supported to the extent the law allows. As a former member of a school board I am no stranger to being open. While there is a place and time for Executive Session, it is important for our members to hear and see firsthand what their representatives are discussing and the depth of the issues involved. Being open allows for the public to be more appropriately informed and it cuts down on rumors and misinterpretation while reducing the allegations of impropriety. It is unfortunate the PMC is governed by volunteer Board members. It is my opinion elections are won on personality traits rather than management expertise. Davis Stirling is a copulation of California Civil and Corporations Codes. The Chairman of the Board controls all the meetings. Failure to follow these regulations is lack of knowledge. I have a history of understanding Robert’s Rules, Davis Stirling and PMCPOA governing documents. I support our newspaper publishing PMC news. I do not support the secret meeting behavior. This is a whole community not a select community. Davis Stirling guides us to meet all regulatory requirements. The press is and should always be welcome as an objective ear to keep all in the community appraised. Video taping is a good documentation tool that simply replaces a secretary. Welcome to the 21st century. The board should always remain transparent, conduct themselves with honesty, integrity and credibility to the membership of the community. By allowing video taping of all open board meetings, this allows PMC association homeowners the opportunity to review these forums. I would encouraged PMC homeowners to attend meetings and ask questions. Our current board has put in a lot of time and effort in order to make this a better community in which we live today. Transparency and openness is a good practice and important part of any association, especially PMCPOA. Currently all committee meetings welcome Members and certainly the Board Meetings are open with ample time for the Members to speak. Being public with all kinds of communication from minutes, to letter received, a monthly magazine and videotaping of meetings are important ways the Club communicates with its Members. The newspaper reporting is an added benefit if possible. I will learn the Davis- Stirling Act so I can follow the regulations it sets. When a meeting starts to drift into something that in not in accordance with the rules, I will advise my colleagues’ the discussion needs to stop and why. I have spoke in support of videotaping the meetings and believe we have a fiduciary responsibility to the other members therefore, our actions should be followed and printed in the newspaper. A backroom deal by any other name is still a backroom deal. I am passionate about transparency in any governing body. I strongly support any legal means to achieve it, as I support anyone committed to ethical and factual reporting. I will not stand for any action, policy or behavior that places The Board above Community. ALL community issues should be of concern to the membership; again, it’s about actively caring: clearly a two-way street. Are there conflicting visions for the future of Pine Mountain? How would you define those? Compare those to your own vision for the future and explain how you will use your unique skills to work toward that vision. I’m not sure that there is conflicting visions for PMC, so much as there are misunderstandings of our CC&R’s and their role/purpose in PMC’s future. Those who want a closed country club atmosphere are few, and I am not one of them. My vision is to follow the law as it relates to our tax exempt status and provide services to as many of our members/guests as possible. Inclusion, not exclusion, is my goal. Some say go back to simpler times, some say resort-like and others to stay ‘as is.’ It is about balance and finding it with a varied community. There are great traditions and amenities here that should be respected. However, there’s some room to appropriately take advantage of the desires of members who in the last decade have invested in our future as well. We can do both by working together to strike an acceptable balance. There are conflicting agendas for the future of PMC. One group wishes that PMC be more like a private country club with all the privileges and costs. I am a member of the opposing group that wishes to make PMC a quite mountain village. This objective can be obtained with skillful management of all available funds that repair and maintain the current assets. I have the management skills and knowledge to accomplish this goal. The two ways are: Those who would tear down and rebuild (the expensive way) and those who would prefer to maintain and cherish the past endeavors. I choose the latter. We need to maintain the current services which rival most clubs today in cost and ability to maintain. As a community we are all very diverse in our ways of thinking. There will always be conflict or opinions on how PMC is managed. As a board member I would be open to suggestions from the community by diligently listening to input from both sides, researching the information and making a decision based on fact. By doing this, it will make for a more enjoyable and safe community to reside in. There are probably as many views as property owners. My vision is a financially strong small mountain community that listens to its members and makes the hard decisions on what should and should not be financially supported. I return to the theme of mentality: most residents are here to fulfill a joyful lifestyle and some seek more tangible gains; thus the issue of conflicting visions. My personal vision and mission has always been to support and contribute to everything good that was already in place. Change is inevitable but it can be about evolvement or devolvement. I reject devolvement; I don’t want PMC to reflect the deterioration of our society at large. 1) The sequence was determined by candidates themselves. All candidates were sent the questions at the same time. The first to reply is the first in the forum line-up; the sequence of the others is based on the time-stamp on their email replies. 2) What you are reading is exactly what the candidates submitted. Word budgets were provided for each answer. No typos or word choices have been edited by the newspaper. 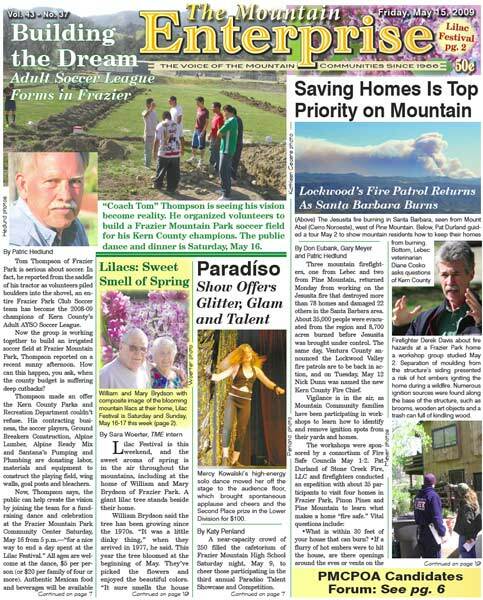 This is part of the May 15, 2009 online edition of The Mountain Enterprise.